It seems these days that most companies have a chosen charity to support financially and follow the progress of – and we think our chosen charity is pretty amazing. 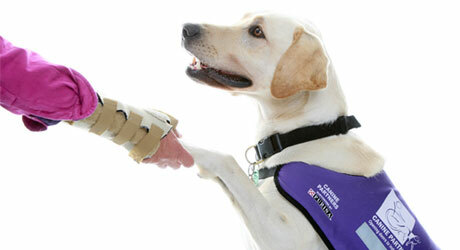 At Pets Corner we could think of nobody better to help than Canine Partners, a group of determined and dedicated individuals who train assistance dogs to make life better for people in need of a helping paw. Recently, I had the pleasure of meeting an extraordinary man and his Canine Partner (a handsome black Retriever called Guy), and I learned exactly how fascinating and amazing these dogs actually are. Guy is able to wake his master in the mornings (without also waking his wife!) and get him ready to start the day, before staying by his master’s side to assist with everyday tasks and provide some very appreciated companionship. Have you ever witnessed a dog loading a washing machine? Or picking up a dropped credit card so gently as not to leave teeth marks? Perhaps flicking on a light switch, or fetching clean clothes. A Canine Partner can do all of these things that many of us take for granted, and so much more besides. For many people, these clever hounds represent the gift of independence and freedom. This year, in December, we’re trying to raise a total of £20,000 for Canine Partners as a rather well deserved Christmas present – and we want to do it with you. Simply text “PETS24 £5” or any other amount to 70070, and we will match your donation. Even a small donation makes a difference; lots of small donations add up! We’re very excited about this, and even on an individual level I’m really enjoying the process of watching the total go up. I’ve sent in my donation, and I feel really good about it too! I have Guy to thank for that – he’s worth every penny. And so much more.